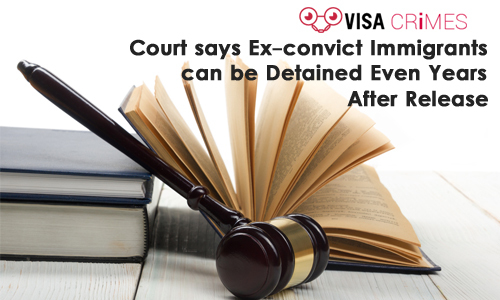 On Tuesday, 19 March, US Supreme court ruled in favor of the government when it declared that immigrants who have past criminal records, irrespective of how long they have been released from custody, can be detained by the government without the need of a bond hearing. US statute simply states that convicted immigrants can be detained when released which led to questions about whether detaining an immigrant without a bond hearing must be immediately after their release from custody or it can happen even much later, months or even years. The case was raised by legal permanent residents who have criminal records which could see them being removed from the country. The case ended in a 5-4 vote in favor of Trump’s administration. Immigrants who came up with the case argued they were entitled to bond hearings while making a case for their release but Justice Samuel Alito said the law does not support their claim. The Supreme Court ruled that the detention of the immigrants by the federal government is mandatory whether it is immediate or even much later. The court emphasized that its stand is based on the language of law at hand; hence it said it would be absurd to interpret the law in favor of immigrants who posed a danger to the country because they were not removed immediately they got out of custody. This case is as a result of the present US administration’s immigration hard stance, and the ruling is set to affect a presumably considerable number of immigrants as the court says 30,000 immigrants are held each day by the government as their deportation proceedings are being held.